Garmin Forerunner 910XT is the perfect watch for swimming, biking and running. 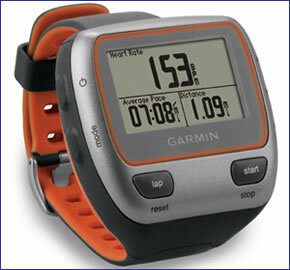 This wrist watch will record time, distance, speed and pace. You can also record ascent and descent information using the included barometric altimeter. The 910XT is waterproof to 50 metres and will also record swim distance, stroke identification, stroke count and pool lengths. You can receive vibration alerts to help you meet your goals. There is a 20 hour battery life so the watch will keep working throughout the most enduring of workouts. It is easy to switch between sporting activities and you can also mount the watch on a bike. Garmin Forerunner 910XT has been discontinued. The Garmin Forerunner 910XT watch is the perfect training partner for use when swimming, biking and running. It features GPS receiver and it is comfy to wear around your wrist. The battery life is up to 20 hours. The forerunner 910XT wrist watch will record time, distance and speed or pace. It also features a barometric altimeter so you can record elevation data, ascent and descent as well as gradient information. You can also receive vibration alerts so you know when to take nutritional breaks or help you stay with a particular range to meet or beat your goals. The Forerunner 910XT records swim metrics in both open water and pool swimming. It is water resistant to 50 metres. It will record swim distance, stroke identification, stroke count and pool lengths. The 910 also captures the track taken and can be uploaded to a computer and reviewed. The 910XT will also calculate your swolf score. Swolf is a combination of the words swim and golf. The way swolf is calculated is your lap time is added to the number of strokes you have taken. At the press of a button you can switch between sporting activities meaning you can quickly transition between sports/workouts. Furthermore a quick release mount makes it possible to move between your wrist and bike. There is an optional ANT+ sensor which can be used with the speed/cadence sensor for cycling. Furthermore it is compatible with the premium heart rate monitor. There is also a pedal-based power meter known as Vector. There are three versions of the Forerunner 910XT. These are the watch only, watch and Heart Rate Monitor and Triathlon version which includes the watch, Hear Rate Monitor and Speed/Cadence Sensor. All three can be purchased by selecting the correct version above. The Garmin Forerunner works with Garmin Connect which allows you to view maps and detailed metrics. You can plan new routes and customise your workouts.